​​​​ CORPUS CHRISTI – Transport Enterprises Ltd./PEI Properties Inc. has sold a four-building, 95,000-sf industrial property. The asset is on 14.35 acres at 7749 and 7753 I-37. Three buildings are leased to FleetPride, and one houses United Rentals. 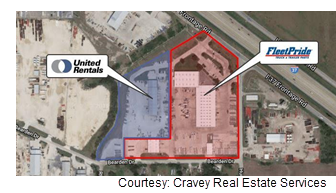 Cravey Real Estate Services Inc. represented the seller. The properties were listed for $12.6 million.